Economics in Godfrey Okoye University (GOU) is obviously a lively and evolving science, which aims at exposing students/scholars to economic way of thinking (rational reasoning). This way of thinking helps one gain insight into how the economy works and how it could be made better. 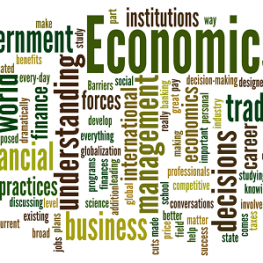 Economics by definition is a social science, a study of the behaviors of humans in groups. Given this concern, the central problems of economics are related to the fact that resources are limited relative to ‘wants’ (or alternative uses). This leads to issues of efficiency and equity in resource use. Therefore the ultimate goal of economics is to provide useful policy advice. The vision of Department of Economics at Godfrey Okoye University (GOU) which is line with the University’s vision is to produce graduates imbued with the skill to understand and make contributions to the development of Nigeria and the global community. Fundamentally, an economist is primarily an analyst. As such, the department seeks to produce graduates equipped with modern analytical, quantitative and expositional skills as well as expert intuition to help them become world class economic analysts. Students acquire general socio-political as well as specialized economics knowledge in order to meet the human resources needs of society and in order to be responsible human beings. 1. Help its student develop critical thinking in order to identify, understand and appreciate economic problems of society. 2. Help students be able to apply modern economic theories and quantitative methods to solve economic problems of society. 3. Help students gain expertise in particular branches of economics while maintaining a general knowledge of the economic models and methods in several other areas in order to become versatile upon graduation. 4. Help students develop modern economic techniques to synthesize, analyze and articulate economic forces influencing the economy and society; be able to propose appropriate policy solutions in the interest of humanity and the environment upon graduation. Candidates for admission into the four year degree in Economics should possess a Senior Secondary Certificate Examination (SSCE), General Certificate of Education (GCE), NECO or their equivalent with at least five credit passes, at not more two sittings. The five credit passes must include Mathematics, English Language, Economics and any one of the following: Geography, Physics, Additional Mathematics, Agricultural Science, Government etc. In addition candidates must have acceptable passes in UTME. Candidates for Direct Entry admission shall satisfy similar requirements as UTME candidates except that at least two Subjects which must include Economics shall be at Advanced level, provided that such passes are not counted at both levels of the examination. Candidates are expected to satisfy the Godfrey Okoye University requirements for admission by direct entry.